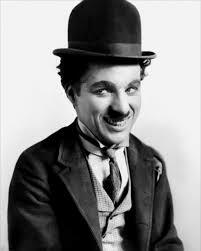 Chaplin was born in London, 16 April 1889, to parents who worked in the entertainment industry. At an early age, his alcoholic father passed away, and later his mother had a breakdown and was taken to an asylum. This left Charlie and his brother to fend for themselves. Following in their parent’s footsteps, they were drawn to the musical hall, and Charlie gained a prominent reputation as a performer. In 1910, Charlie travelled to America and gained experience in the fledgeling film industry. It was here in America that he was to develop his first famous characters such as the Tramp – the trademark Charlie Chaplin character of a bowler hat, moustache and ill-fitting clothes. Charlie Chaplin became the great star of the silent era, and his popularity spread throughout the globe. Charlie Chaplin had tremendous intensity. He would finance, write and direct all his films himself. He was a great perfectionist and would make his actors perform scenes up to 100 times to get it just right. Yet he also liked to improvise much of his performances and would not stick rigidly to a script. Some of his most famous films include – City Lights (1931) and The Great Dictator (1940). The Great Dictator was a satire on the totalitarian dictators of Hitler and Mussolini. Chaplin himself played two roles – a Jewish barber, who was discriminated against. He also played the role of the “Adenoid Hynkel – dictator of Tomania a clear parody of Adolf Hitler. The film was made one year before the US entered the war against Germany, and was controversial at a time when anti-Semitism was rife in America. Despite his parody of Hitler in this film, Chaplin refused to publicly endorse the war effort in 1942 – causing the authorities to become suspicious of his political leanings. In the post-war period, the FBI under J Edgar Hoover kept close tabs on Chaplin because of his perceived left-wing ‘ Communist views’ Eventually, the US authorities decided to revoke his entry visa into the US and Chaplin was forced to live in Switzerland. Charlie Chaplin later said he was not a Communist but refused to condemn Communists because he disliked the nature of the McCarthy era. “Friends have asked how I came to engender this American antagonism. My prodigious sin was, and still is, being a non-conformist. Although I am not a Communist I refused to fall in line by hating them. Chaplin had great comic talent; this was a talent that shone through in his silent films but also in later years. Chaplin was put forward for a knighthood in 1956, but, it was blocked by the Conservative cabinet who feared a backlash from the American government. He came out of exile to receive the award and the longest standing ovation in the history of the Oscars. Charlie Chaplin had a turbulent personal life. He had 11 children with three different women and had several other girlfriends and marriages. He died in his sleep in Vevey, Switzerland on Christmas Day 1977.